Telluride Blues and Brews. Photo by Ryan Bonneau. In the early 1900s, 35 establishments existed for thirsty drinkers to belly up to the bar in Telluride. Despite the front pages of the local newspapers, The Daily Journal and San Miguel Examiner reporting the town would “abide strictly by the law no matter what the loss”, you could get a drink just about anywhere, including the courthouse. When the taps went dry, speakeasies and soda parlors took over where saloons left off. Years later, when skiing came to Telluride, locals ushered in a new era of drinking history. 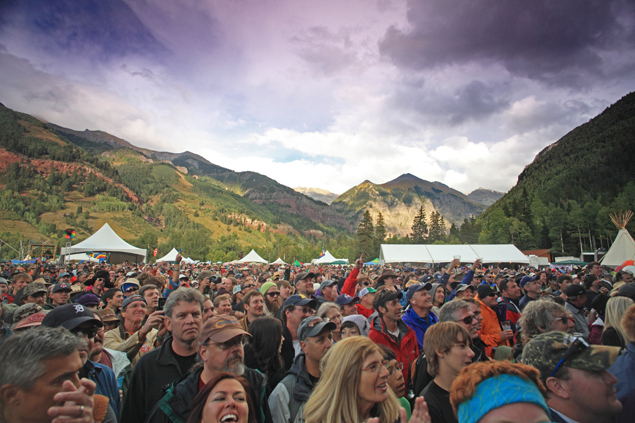 This year, September 13-15, the Telluride Blues and Brews Festival celebrates its 20th anniversary, offering the best opportunity of the year to celebrate beer in this historic destination. The Black Crowes, Jim James and Melissa Etheridge will headline the 3-day festival and there will also be a sampling of more than 50 of the best craft breweries in Colorado and the country including the Aspen Brewing Company, Durango Brewing Company and Telluride Brewing Company. For those who are unable to attend, there are plenty of other historic drinking establishments to visit and signature drinks to sample throughout the year. The New Sheridan Bar, which Fodor’s has called “a favorite hangout”, remains much as it was when it opened in 1895, retaining its original handsomely carved front bar, mahogany wall paneling and ornate light fixtures. Cocktail aficionados agree that a visit to Telluride is not complete without going to There Bar. Proprietor Andrew Tyler left New York and his eight-year tenure with Nobu Restaurants to open ‘There’ and bring his passion for travel and eclectic cocktails to the Southwest. Like Telluride, There was designed to feel like guests are entering a well traveled home and comes complete with tapas, comic book style menus and even time cards. Thirsty guests who frequent There can keep a precise log of the hours they’ve “slaved” at the bar. The patron with the most hours clocked at the end of the season is awarded a special surprise such as dinner and drinks at where else, but There. Known to locals as “The Buck”, The Last Dollar Saloon is famous for its margarita, which can be had by the pitcher. Now in its 35th year of consecutive operation, the bar has kept its original brick walls and pressed-tin ceiling, not to mention an unpretentious atmosphere where all are welcome. Alternatively, visitors can get a taste of one of the world’s highest altitude microbreweries at the Telluride Brewing Company. Water from the mountain snowmelt is used to create local favorites such as Bridal Veil and Ski-in-Ski-Stout. In winter, beer lovers can take a fat tire bike tour with Bootdoctors to tour the brewery and sample the beers from the source. Nestled within Southwest Colorado’s dramatic San Juan Mountains, Telluride, Colorado, (elevation: 8,750 ft.) is known for its world-class alpine skiing, awe-inspiring landscapes and vibrant summer festival season. The former mining town lies in a box canyon, surrounded on all three sides by 14,000-foot peaks, which provides the ideal environment for hiking, mountain biking, trail running and other outdoor activities. Telluride is linked to the neighboring Mountain Village (elevation: 9,540) by a free, scenic gondola – the only transportation system of its kind in North America. For more information or to book a Telluride vacation, visit www.visittelluride.com.